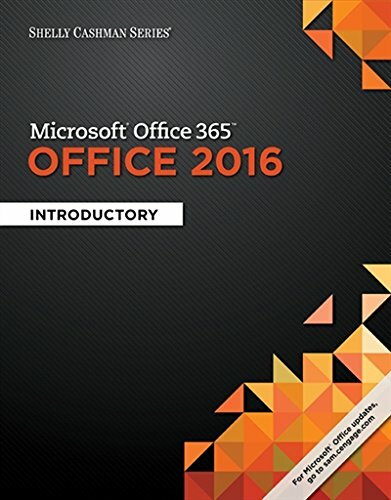 1305870018 -Discover how to maximize the advantages that the latest version of Microsoft Office offers with the focused approach found in MICROSOFT OFFICE 365 & OFFICE 2016: INTRODUCTORY. This new edition is part of the acclaimed Shelly Cashman Series that has effectively introduced computer skills to millions of students like you. MICROSOFT OFFICE 365 & OFFICE 2016: INTRODUCTORY continues the Series’ strong history of innovation with an enhanced learning approach to address your needs, no matter what your learning style. A trademark step-by-step, screen-by-screen approach encourages you to expand your understanding of Microsoft Office 2016 through experimentation, critical thought, and personalization. This new edition delivers the most effective educational materials specifically designed to engage, improve retention, and prepare you for success.